Fame: Busiest performing arts centre in the world. 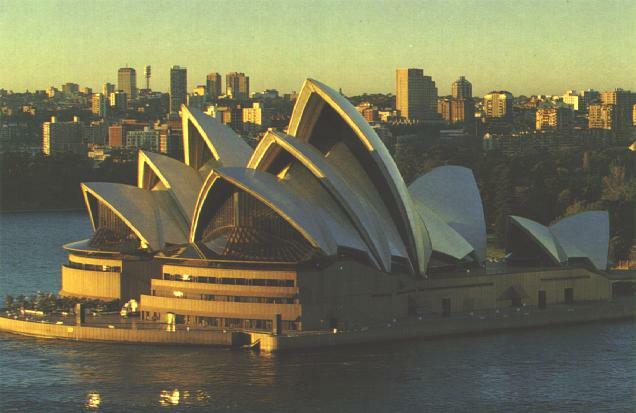 Where can I learn about the Sydney Opera House? View the Sydney Opera House on a Google map. Reception Hall, five rehearsal studios, four restaurants, six theatre bars, extensive foyer and lounge areas, sixty dressing rooms and suites, library, an artists' lounge and canteen known as the "Green Room", administrative offices and extensive plant and machinery areas. - The building covers about 1.8 hectares (4.5 acres) of its 2.2 hectare (5.5 acre) site. It has about 4.5 hectares (11 acres) of usable floor space. - It is approximately 185 m (611 ft) long and 120m (380 ft) wide at its widest point. The highest roof vault (above the Concert Hall) is 67m (221 ft) above sea level. - The roofs are made up of 2,194 pre-cast concrete sections. These sections weigh up to 15.5 tonnes (15 tons) each. They are held together by 350 km (217 miles) of tensioned steel cable. The roofs weigh 27,230 tonnes and are covered with over 1,056,000 tiles arranged in 4,253 pre-cast lids. - The entire building weighs 161,000 tonnes. It is supported on 580 concrete piers sunk up to 25 m (82 ft) below sea level. The roofs are supported on 32 concrete columns up to 2.5 m (8 ft) square. - The exterior and interior walls, stairs and floors are faced with pink aggregate granite which was quarried at Tarana in New South Wales. The two woods used extensively to decorate the interiors are brush box and white birch plywood which were both cut in northern NSW. - There are 6,225 sq m (67,000 sq ft) of glass, made in France, in the mouths of the roofs and other areas of the building. It is in two layers - one plain and the other demi-topax tinted. About 2,000 panes in 700 sizes were installed. - There are 645 km (400 miles) of electrical cable. The power supply, equivalent to the needs of a town of 25,000 people, is regulated by 120 distribution boards. Twenty-six air-conditioning plant rooms move more than 28,500 cubic metres (1,000,000 cubic feet) of air per minute through 19.5 km (12 miles) of ducting.